Google came out with a new version of Google Lens in beta, the company announced at its annual developer conference on Tuesday. If you have one of the ten additional Android devices that are getting Google Lens inside their native camera apps, you’ll be able to access the feature simply by going into your camera and seeing the icon on the bottom right. Tapping on the icon activates the Google Lens feature and you’ll be able to point your smartphone camera at objects and different sights to identify more information about them. Google Lens is also getting a real-time finder that will analyze what your camera sees even before you tap on the display. The tool will process the pixels through machine learning to provide more details and also provide relevant search tags. Which devices are getting Google Lens? Initially, it was just the Google Pixel 1 and Google Pixel 2 that had access to Lens. Now, as part of the latest update to Google Lens, the feature is coming to ten additional Android devices inside their native camera apps. So far Google has only revealed the manufacturers of those ten devices: LG, Motorola, Xiaomi, Sony Mobile, HMD/Nokia, Transsion, TCL, OnePlus, BQ, and Asus. We’ve reached out to Google to find out which specifically which devices will receive Google Lens. What are some of the things Google Lens can identify? Google Lens can identify clothes, books, buildings, plants, animals, and works of art. It’ll be able to pull relevant shopping results for clothes it snaps, titles of books, more information about landmarks, and details about paintings. It can also tell you what species and classification is an animal or plant. Additionally, Lens will soon be able to play a music video if you point your camera at a poster of a musician. It can display movie times when you’re outside of a theater. And through the new smart text selection feature, it can save the contact information from a business card, and add an event to your calendar from a flyer or billboard. There’s also a crossover between Google Lens and Maps this time around, which will add AR to Street View and help you navigate in real time. When will the new features be available? 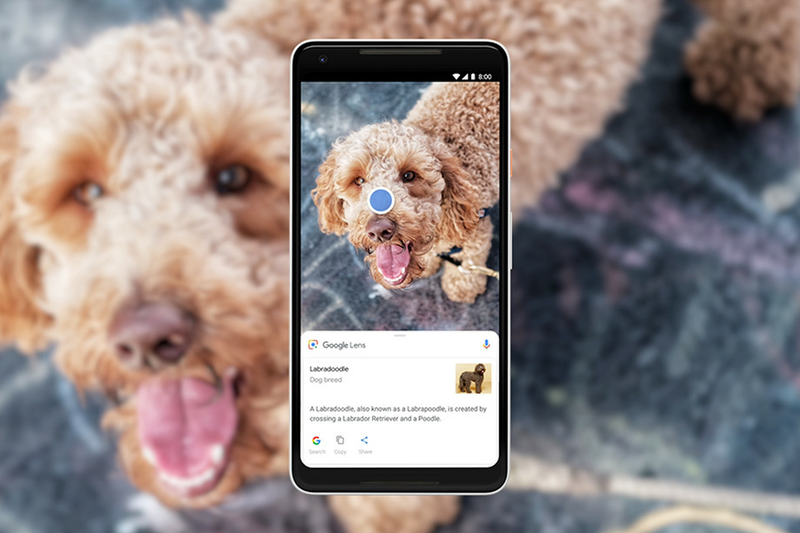 Google Lens’ new features are set to roll out over the next few weeks.